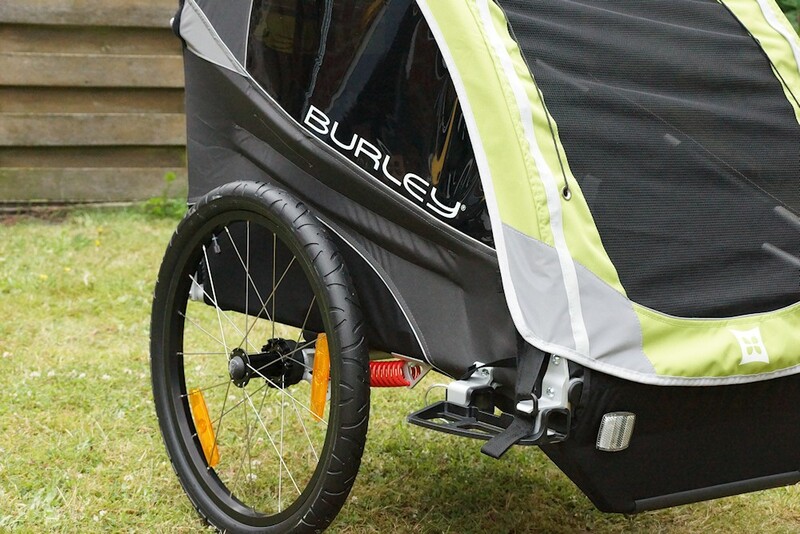 In Burley D’lite Test gets the bicycle trailer of us the chance to show what he has on the box.We look at handling, assembly, expansion options and the user’s life. the Burley D’lite was supplied from a normal package service, up to the front door. 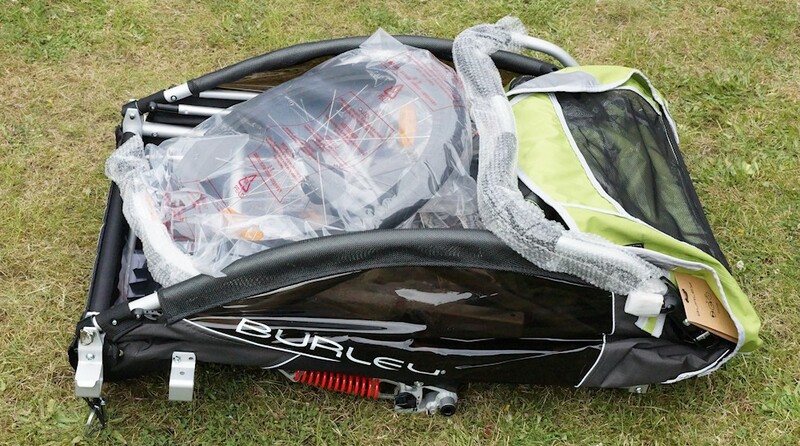 The carton is the product provided in accordance with size and with an imprint from the trailer.When content, we have the Burley bike trailer itself, the tongue, the 20 inch wheels, the pennant and a parts bag. Here we have two small parts we need for the installation. Also present a manual incl. Assembly instructions. All parts are packaged in a foil and are thus protected from unwanted scratches. pulled out of the film and taken the above listed parts out of the trailer, the installation can begin. The child carrier was folded in a box, we only need to pull apart and place it. For this we draw the upper frame of the back and fall through the seat to the rear frame tube. Now we have to muster some strength and squeeze the frame tubes. Here falls equal to the locking function, a small bracket is thereby pushed to the side and the frame tube can engage here. With this process is stretched at the same time on the backrest. The Burley D’lite taking shape and looks almost finished. The push handle is pre-assembled and is collapsed. There is a handle on the side of the bracket. If we solve this, we can adjust the position and adjust to individual body size. During assembly, we note there are steps that we know of other bicycle trailers and manufacturers that no longer apply. The side walls are already stabilized here with additional tubes. Overall, we have 2 stabilizers per side. We take one wheel and press the «Push» button in the center of the wheel hub. Now we can insert the wheel on each side. With the release of the button is fixed, the wheel and the installation is done in a few seconds. For better handling we have the Burley D’lite shot for this step to the side. The body is now set and the wheels are mounted. For this, we needed less than 8 minutes.Let’s look at the next two black plastic wedges. We suspect that this is about the spacers or mudguards. According to the manual it is used with a double function. We take the wedges and insert them on the sides in the provided, square holes. With a click or snap system therefor no tools required. Due to the dual function of the spacers must be mounted far forward, so ours is a little too far, since the protective function for the wheels suffers somewhat. Next we mount the safety flag, as well as have the handlebar a little support. If you stand behind the trailer, is this on the left side. Here only a spring-loaded button must be pushed in and the flag can be reingesteckt. As this support is on the handlebar and the flag would adjust the angle, provides you around the handle, you can mount the pennant also individually. is the insertion of the square drawbar on the lower right side. To date, the first trailer in our tests, in which the drawbar is square, not round. The tie rod is now inserted into the opening, in which we previously the spacers or the tire protection (called Burley wheel cover) have set.The drawbar latches and will be secured with a cotter pin. The Burley D’lite is now fully assembled. Overall, we use hand for about 15 minutes. For mounting the towbar we solve the nut on the rear axle and turn it loose. Now we are in the time-bar of the trailer coupling on the axle bolt, outside the frame and turn the nut. A special regard to assembly, we do not find. It is also true in this step, who is unsure or has the quick-locking device sitting on the wrong side, should consult a professional. The trailer coupling is assembled and the Burley D’lite can be coupled. 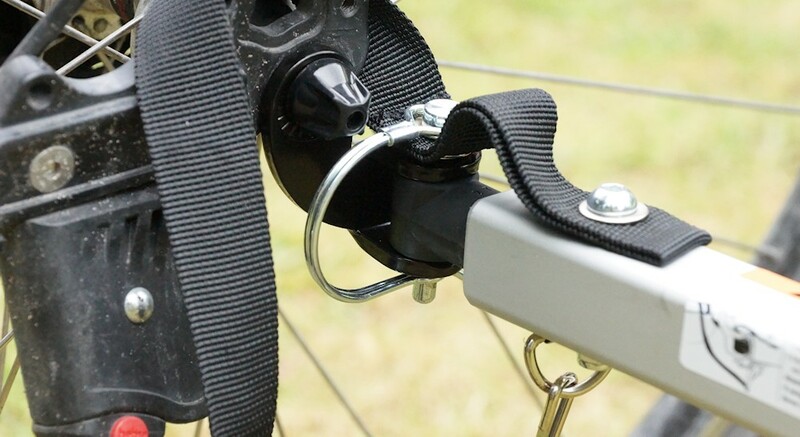 we lead to coupling from Burley D’lite the drawbar towards towbar: Next, we move the head so the clutch zoom that with the safety pin, from top to bottom, can secure the tiller head. We then attach the tether. We introduce it again by the triangle of the chainstay and secure it in connection to the eyelet on the drawbar. Now the trailer is secured for the real thing. The trailer has a roll bar, which is formed by the strap. The push handle therefore has a dual function. joined all the way forward, it is in the case of a rollover prevent the impressions of the trailer. To be seen offering the Burley bike trailer two white reflectors at the front and two red at the rear. To the trailer around, there is a reflective stripe. The position of the reflectors is well chosen. 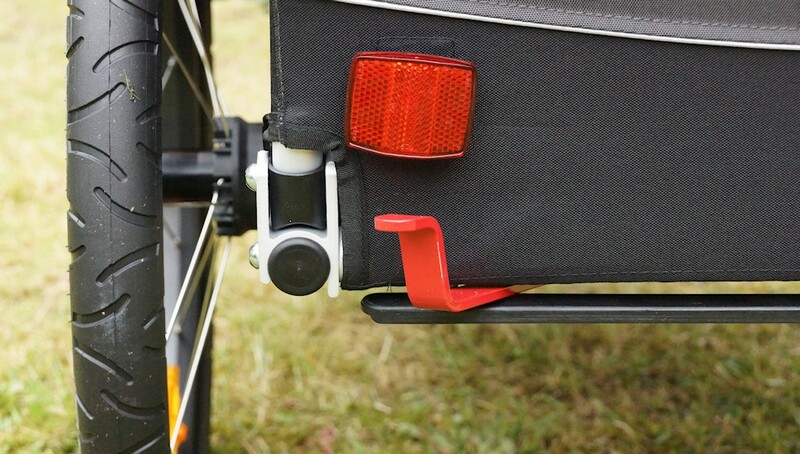 Burley is the only of the bicycle trailers that we tested an attachment for a separate taillight.Here, on demand a bracket (included) are screwed to the rear side. At this mounting space for a rear light (not included). For scores of Burley D’lite in terms of safety and be seen. More on the subject can be found in the article on bicycle trailer test . Thus one can also park safely the bicycle trailer, he has a brake. At the rear is a red pedal. In the braked position he is far left. To activate the brake, it leads him to the far right. Now driving security bolts of the wheels and brake the child carrier. The brake is very easy to operate and are yet no way to activate them accidentally. You have to pay any hand from the handle book (eg in the buggy mode). The suspension of the trailer is immediately apparent. The red feather feathers reminiscent of red brake pads for sports cars. A real eye-catcher. The function is available while still in the foreground. 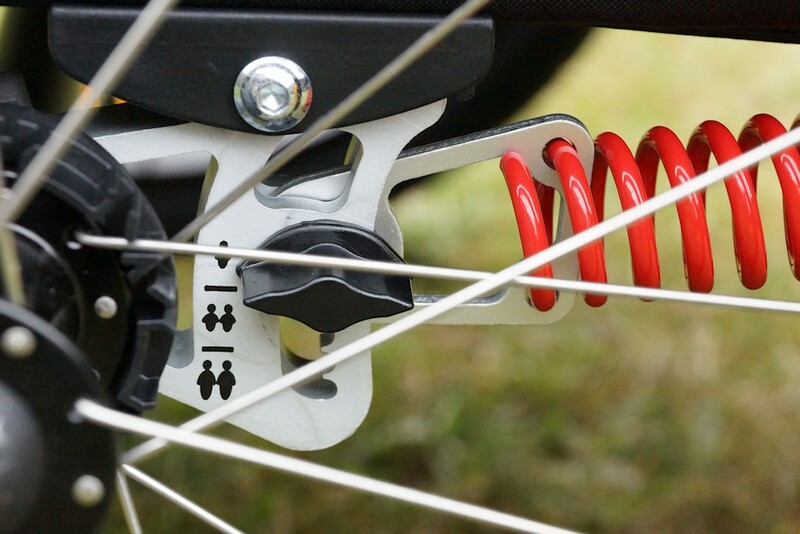 Burley has created a very simple way, the spring action individually adapt to the number of occupants. Register here to set the cap screw to the desired number of people and have changed the spring behavior. The advantage of this type, there are 3 predefined levels that are the same on both sides. No counting revolutions, as you upload the spring plate or must turn down. In the 20-inch wheels are yellow cat eyes. Finally, he makes a pennant for more security «be seen» at by other motorists. However, it must be said to the fact that the red pennant about 10 cm lower ends of this model than other models in our test. The child carrier from the house Burley look very sophisticated and very well made. Some seams are double stitched. In the compounds was set to connect, screw or weld connections.The welds are made very clean. The pipes are strong diameter and made of lightweight aluminum. Moving parts have no play, the folding mechanism is very solid and trustworthy.The side windows are slightly darkened, this prevents the sun at full strength warms the interior. be leaning the side parts of two stabilizers. The shift feel and touch feeling of the trailer are positive. Here one has the impression that there were quality materials processed. The sun canopy, the side windows and insect screens are well stitched. The mesh of the grid are sufficiently small. Even very small insects are kept away from the interior. The drawbar makes a solid and solid impression, the towbar a quality image. Used eyelets, Velcro fasteners and connectors also make a good impression. The D’lite of our tests can transport two children. Inside there are child seat similar seat switch and for each seat there is a 5-point harness respectively. 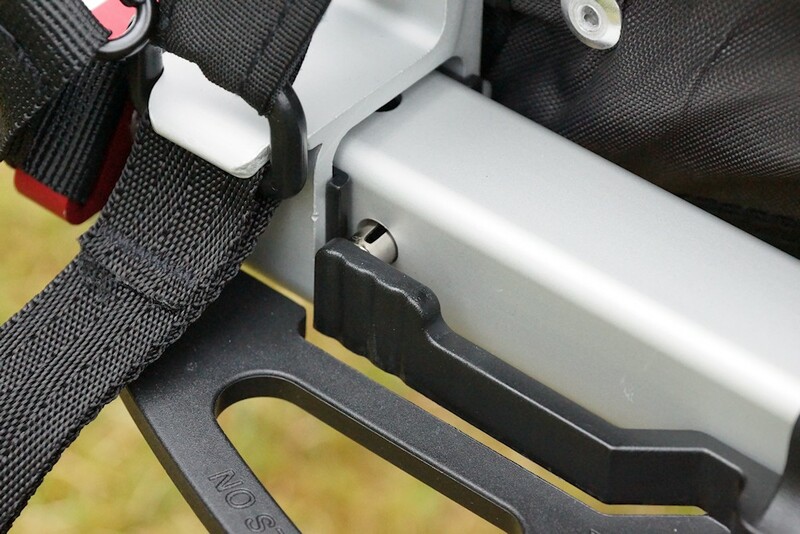 Behind the backrest, the belts can be adjusted on demand in length. 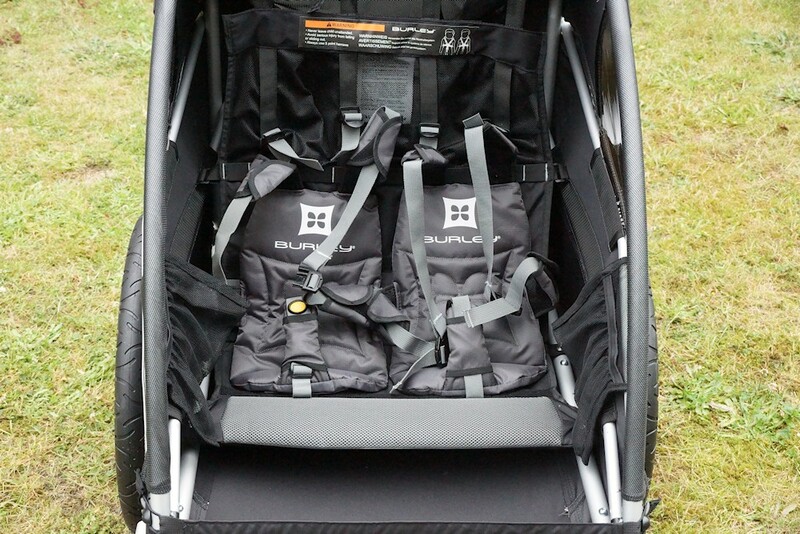 The seats and knees, like the cover of straps padded.Inside and on the backrest from Burley D’lite safety instructions are read. There is one called every time you ride in memory to use the belts and to pay attention to safety. The application of belts was very intuitive and simple. Does the child still and brings to it playfully to the use of a child trailer zoom, handling and use is very simple. Burley gives Note: If only one child transported in a two-seater trailer, the child must always sit right. Please also only bicycle helmet use. Behind the seats there is storage space for blankets, shopping, bags or accessories. Here you can certainly put a little shopping. On the inside of the rear panel is a small mesh bag. In the passenger compartment is located on either side of a small mesh bag. Here you can place his bottle every child, for example. The Burley D’lite can be rebuilt with a buggy wheel a buggy. Also it is possible to change the function of the trailer for joggers. However, dedicated accessories must be purchased separately. For the installation of accessories the pole is removed and the desired extension inserted and secured in the pole mount. We remember the support we find on both sides. The Burley D’lite runs his clean and well behind the bicycle. The suspension absorbs bumps and the trailer is well on the road. His weight is noticeable when empty, but this is normal in size. Its width you realize quite. 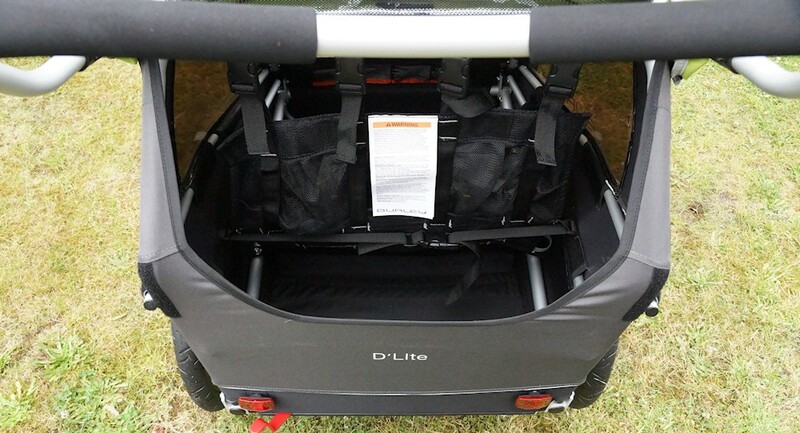 As a two-seater, the D’lite the widest child carrier is such as we had in the test. Especially with obstacles you have to be very careful here. Especially, we have this pinned at the garage door, here is only little space on the sides. Burley recommends a maximum speed of 8 km / h (according to the manual) at a maximum speed of 24 km / h when turning corners. At narrow one should always take a half a glance backwards and never lose the feeling that one is noticeably wider than the own handlebars. The Burley child trailer comes with a sliding sun screen. Here can be dragged and moved (excerpt from insect screens) over the entire front with a cable system the sun canopy.Depending on the position of the sun, this can be adjusted and the children will be protected in the passenger compartment from glare. The Burley D’lite makes a very good and solid impression. It is processed to the point and has a total of very high quality. The assembly was very simple and has little time availed. Tool was not needed here (except for the towbar). The setting of different spring strengths as well as the additional support for a rear light are very good. Tinted side windows provide less direct sunlight on the occupants. According to the manufacturer here more than 96% UV rays are filtered out. The rope system when sun canopy is easy to use. The foot lever brake provides an easy way to park the trailer. Two stabilizers in the side walls give a sense of security. The trailer was built F1975-09 safety standards ASTM. The zippers and the hood are water or driving rain. The fabric completes the total picture. We find, at a purchase price of about 550 euros, the accessories included in should be included. Since not even the buggy wheel is part of the standard delivery, the Burley D’lite can be really used basically just as a bicycle trailer. Uncoupling and Losschieben is not possible at the destination. The costs points. Also points cost the least information about the technical details. The manual is written for this model not only. Unfortunately it is not known as the owner so but, as the extent of child trailer and as the precise loading. We need to see this information on the website of Burley. 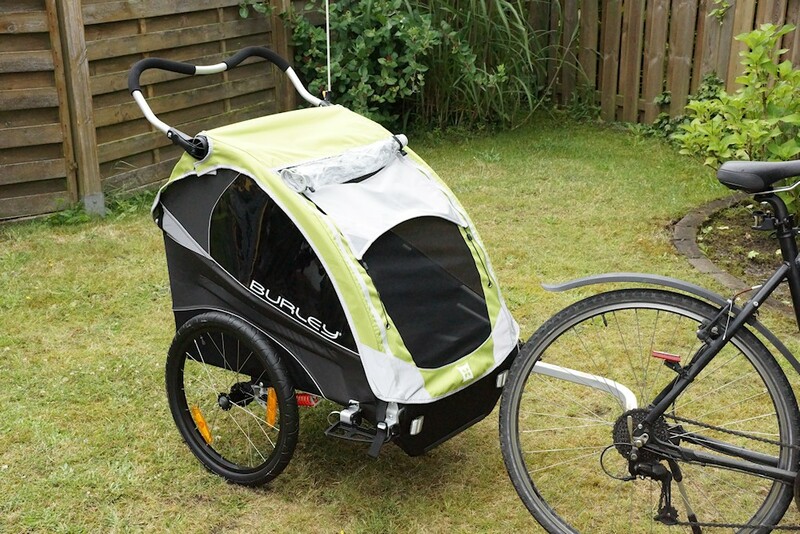 Overall, the bike trailer gets in Burley D’lite test yet 4.5 out of 5 points, receives from us the result «Very Good». This children’s bike trailer you get quality into the house, but at least the very practical buggy wheel must buy separately. Ps to prevent theft simply a separateFahrradschloss carry. Warning: Burley has issued a security update for older models, here , find out whether your model is. Note for Test Procedure: For our test we have for security waived with a child to ride. The testing of borderline situations curbs, traffic lights and narrow streets would have been too risky. Instead, we have placed a weight of 20 kg in the trailer and secured with safety belts. 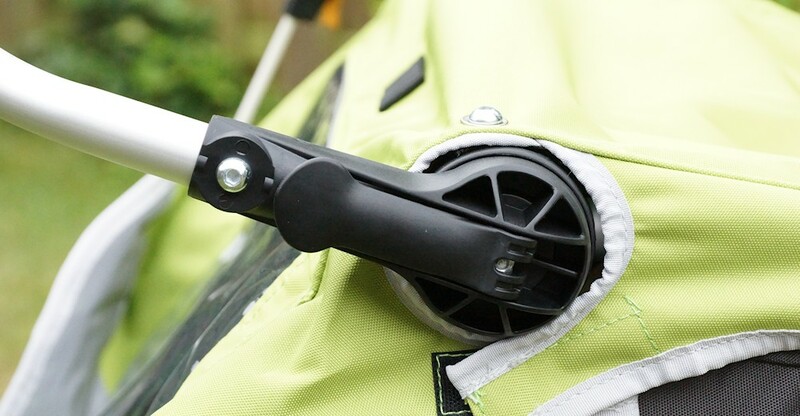 Bike magazine has not tested the Burley D’lite child carrier on security or pollutants. The focus of the test is to use in everyday life. For example, point deduction led: No accessories at quite a high purchase price. The seat we have tested in the state with a child.It should be read in any case the user before use.